Thanks to its particular method, Emploi-e-commerce provides you with the best applicants of the market. Emploi-e-commerce.com est devenu, au fil des années, la référence du recrutement dans le domaine du web et du e-commerce. 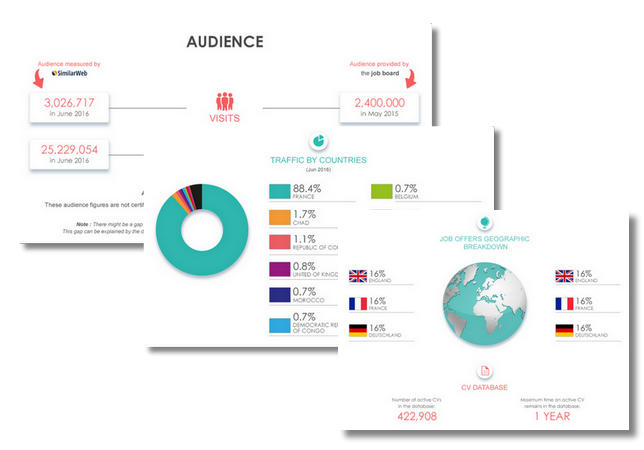 Le site utilise les technologies webmarketing dans le recrutement. Une offre d'emploi devient une campagne de ciblage et d'acquisition de candidat : ceci augmente la qualité des candidatures et permet d'atteindre les profils correspondants à chaque annonce. You can do a quick search by selecting a job category or you can do a general search and then narrow it down according to type of contract, region, category, and salary. Login here for FREE to unlock access to the traffic audience, content and pricing section for more information on digitaltalent. Emploi-e-commece uses the latest webmarketing technology in order to find the rifht applicant for the right job offer. It has exclusive partnerships with popular french websites (such as E-marketing.fr or Ecommercemag.com) and the biggest french E-commerce events (Paris Retail Week and #conext among other) in order to touch only the E-business professionnals. Find out what JobboardFinder users think about this job board. Leave your own opinion in a comment to guide other recruiters and jobseekers for their choice. Do you want to receive a quotation? Do you wish to receive a call back from a consultant in under 24 hours? If you want more information about our media buying and HR proposal, visit our get a quotation section. If you want more information about our online job posting service, visit our Job posting section. You do not have access to the Premium version! 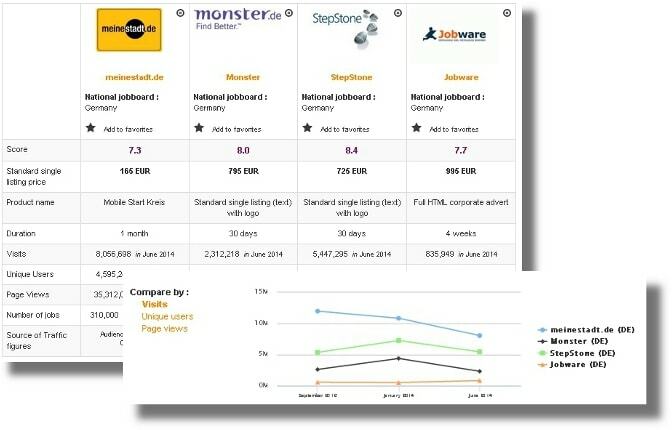 This tab is reserved for our registered users who have subscribed to our Premium offer which is available on this page https://www.jobboardfinder.com/en/premium. To benefit from our furthered analysis of the job board market, you can directly subscribe to the page above or contact us by email or telephone. Our team is at your disposal and listens closely to any suggestion or request. Thank you for your quotation request. You’ll be contacted shortly by our consultants. Jobboard Finder ensures you to benefit from our lowest prices and personal assistance. Our team will take care of your order and pay close attention to your requirements. Languages spoken in our agency : English, French, Polish, Russian and German. Our Job Posting Services are subject to fees. The final price will depend on the type of media chosen.